The only solution for the surplus of workers with law degrees is a massive, permanent reduction in the issuance of new law graduates. America is in the opening stages of a massive surplus of over-credentialed workers. The default setting for 50 years has been: if you want a secure upper-middle class salary, get a law degree, MBA, PhD or other graduate-level professional degree. The massive surplus is now apparent in J.D.s (law degrees) and PhDs. The writing is already on the wall: there aren't enough jobs for law school graduates, and this scarcity of high-paying legal jobs will only increase going forward. The only solution for the surplus of workers with law degrees is a massive, permanent reduction in the issuance of new law graduates. The only way to achieve this result is for a significant percentage of law schools to close their doors. What's the percentage that must close to restore some balance? An unfettered market would discover the price of attending law school and the number of schools needed to fulfill diminishing demand for workers with law diplomas. 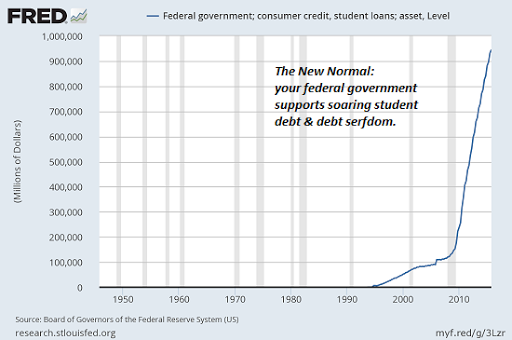 But we don't have an unfettered market--we have a government-sanctioned system of debt-serfdom. Law students can borrow up to $200,000 for a three-year law program, and so surprise, surprise, the cost of that three-year program is--yup, $200,000. 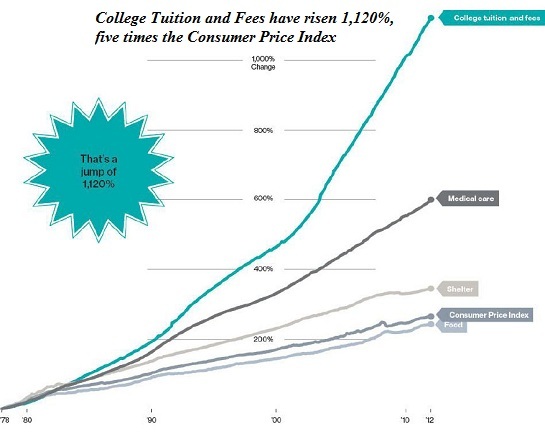 This gargantuan state-supported debt-serf machine enabled prices to soar without regard to the value of the education, its utility in the marketplace or its market cost. The glut in over-credentialed workers is not limited to law: The PhD Bubble Has Burst: Graduating 'Doctors' Are Having Trouble Finding Work (Zero Hedge). As I have often noted, graduating 50,000 PhDs in chemistry annually does not automatically create 50,000 jobs for the graduates. Our system of government-sanctioned debt-serfdom has created perverse incentives for colleges to raise prices and for students to become over-credentialed, a process that has enriched universities and their administrative legions while impoverishing students who are dumped into a job market saturated with over-credentialed but underskilled workers. It doesn't have to be this way. Radically improving our higher education system while reducing the cost of that education by 90% is the topic of my books Get a Job, Build a Real Career and Defy a Bewildering Economy and The Nearly Free University and the Emerging Economy: The Revolution in Higher Education. So how many law schools need to shut down to restore the balance of supply and demand? It depends on how fast technology reduces the demand for legal expertise. A 20% reduction in the number of law schools and law school graduates would be a good start, but if technology and outsourcing start eating jobs, the eventual number of law school closures might have to exceed 50%. One quick way to discover price and demand would be to eliminate all student loans. 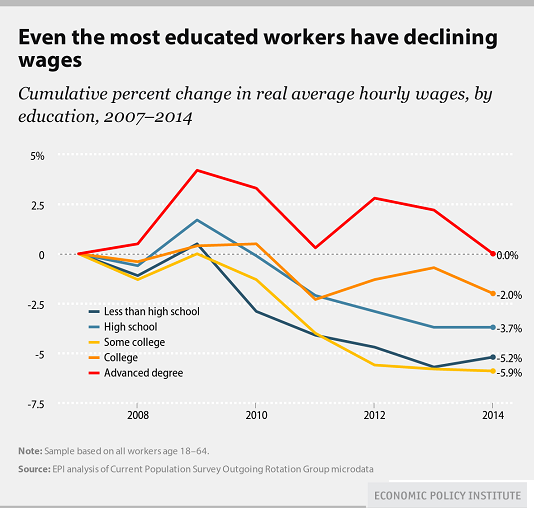 Once students could not borrow money, the cost of higher education would collapse to a cash-value level. The number of colleges and universities would plummet, and supply and demand would soon find a new equilibrium, minus the debt-serfdom.